Two evolutionary outcasts, a Nestrian and a Grymp, are forced to fend for themselves – and each other – when Noah’s ark departs without them. Teaming up with what appears to be a giant slug (looking like an escapee from some misbegotten Manga), the pair must make their hazardous way to higher ground, encountering various slippy/slidey adventures en route, all the while escaping the attentions of a pair of ravenous griffins. Co-produced by Germany, Luxembourg, Belgium and Ireland, this bland animated Euro-pudding has little to offend and even less to excite as it follows its formulaic journey toward a communal group-hug. 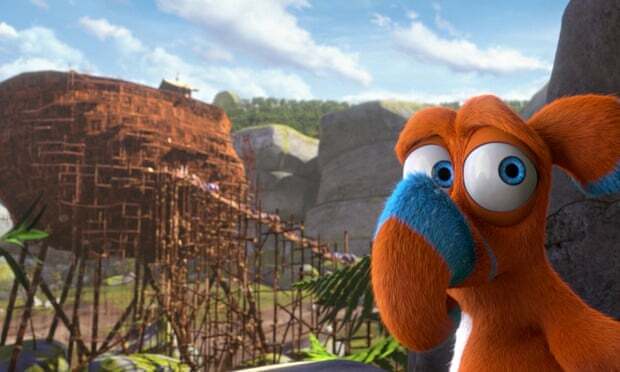 There are a couple of giggles along the way, but nothing you haven’t seen or heard before in the wholly superior Madagascar and Ice Age series. Local hero Chris Evans provides the voice of sticky parasite StayPut, a role that requires him to shout “woo-hoo” once too often.